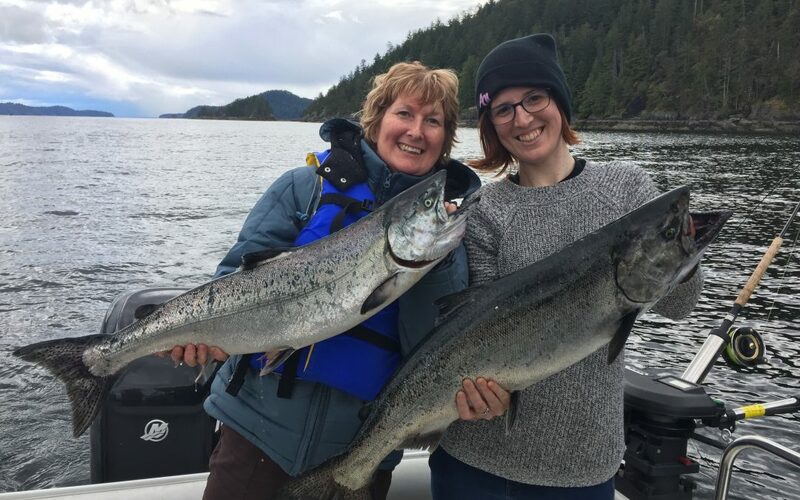 As the 2018 spring and summer season approaches the excitement of prospects for salmon fishing in Comox Valley looks great. The winter fishery for feeder springs in the area 14 has been outstanding with lots of numbers. As the Herring Spawn nears in our local area the feeding frenzy will continue and these local fish will fatten up. Spring fishing in April and May in Comox be fantastic!! I’ve heard reports from Hornby Island that large schools of Herring are already showing up. 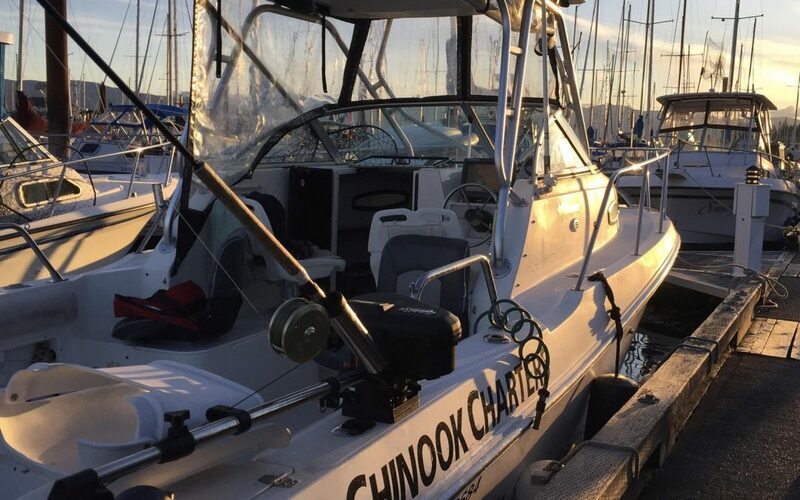 Cliff’s Chinook Charters has offered a Spring Booking discount of $450 for Half Day and $699 for a full day in April May. Generally Fishing is great in these months with little pressure. Please take advantage of this deal. Also don’t forget Ling Cod open up 1 May and if numbers are like last season 2017 it’s going to be a banner year for these fish. Book a full day and request some crabbing also and we will drop some traps! Recently there has been a Sperm Whale siting in our local area first sighting since 1984, so cool to hear. Looking forward to hearing from you in 2018!! Go to the Rates and Packages page and send us an email. I’m honoured to join Pesca Fishing as part of there Pro Staff Team for the 2018 season and beyond. My “go to” PESCA spoons include Gut Bomb, Green Lantern and Leprechaun. 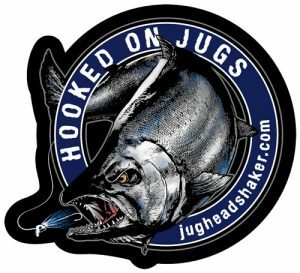 Pacific Angler carries there spoons as well you can contact them online to purchase! June has started has started out with a flurry of Chinook Salmon that hasn’t been seen in our area for a few yrs. Salmon fishing is amazing to say the least! Limits of fish daily hitting the dock from our boat. My new guide Raiden is on top of the fish and I couldn’t be happier. 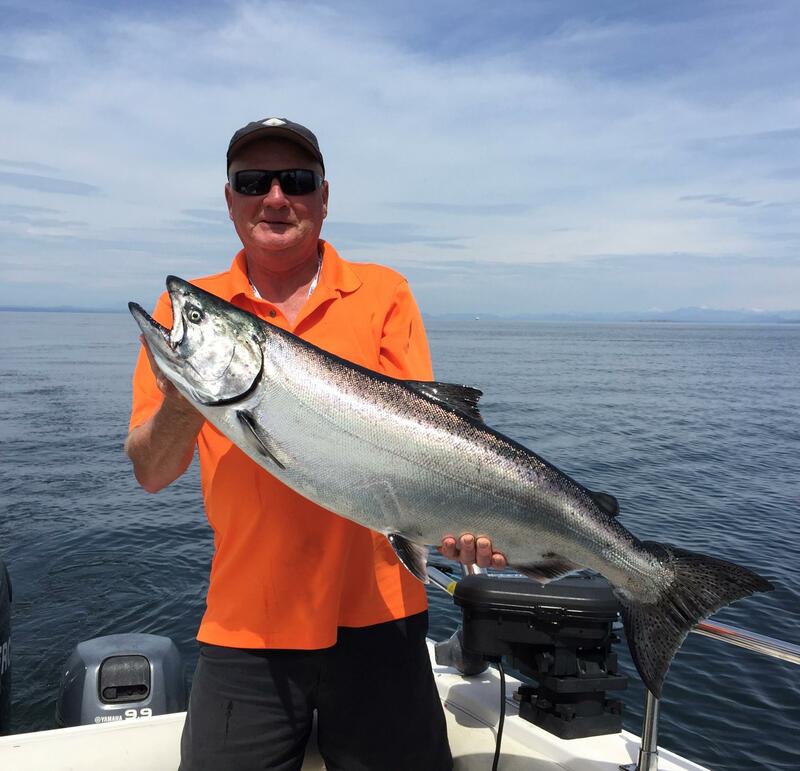 Fishing has been good mainly in our local area in Comox Valley. Campbell River seems to have a slow start. Many of there guides taking the long run down here. 180 ft to 225 seems to be the right depth. Trolling spoons from Pesca Spoons, Ryan’s Left Coast Lures are working well also! Ling Cod action has also been fantastic with Light House Lures new Mega Bite swim tail jigs killing them with ease!! Must have in your tackle box!! I’ve been sending a lot of happy clients home on West Jet with boxes of Salmon and Cod! A few days left on the calendar so contact us for fishing Comox Valley this summer and let’s get out there! So far salmon fishing has been outstanding when weather permits you to get out there and that’s the key word! The strong SE winds have been prevalent this Spring making getting out to the Salish Sea difficult. That put aside last weekend we had a great Mother’s Day fish and caught these two nice beauties on Jughead Shaker’s white glow mini, and Left Coast lures needlefish moon jelly glow spoon. There active feeder Chinook Salmon so I shortened the leader to 4 feet behind a flasher did the trick. Weather in Comox Valley is starting to look promising for this May long weekend, were fishing people from Scotland tomorrow pretty excited about that! Let’s get fishing folk’s! 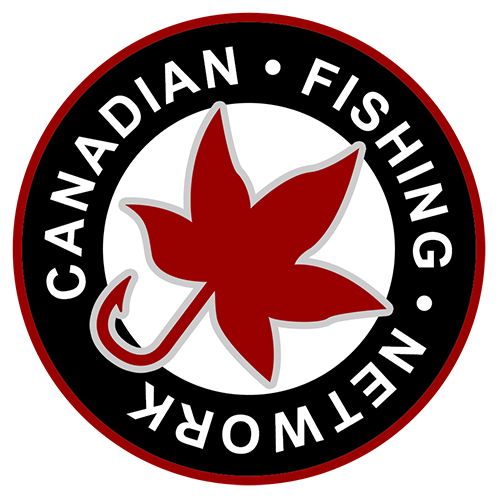 Another exciting announcement I’ve been blessed with the honour of representing British Columbia with Canada Fishing Network let’s show Canada what BC fisherman are all about! Feel free to contact me if you want to get involved! Salmon are still plentiful during the winter season on Vancouver Island. The colder temperatures in the winter provide crystal clear water which allows fishers to cut down on the need to use flashers. 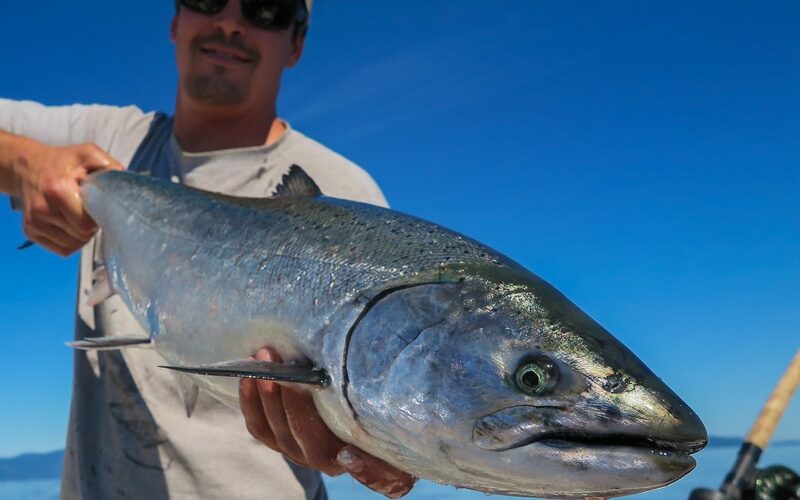 One of the best places to find Chinook at this time of year is at the southern end of Quadra Island. Some of the favourable spoon colours include: Bad Attitude, Cop Car, Red Racer and Kitchen Sink. Cutthroat and rainbow trout as well as Dolly Varden can still be found in Campbell River lakes at this time of year. Two of the more accessible lakes include Buttle and Echo lakes, a 15 and 30 minute drive from Campbell River. Popular fishing gear include: Krocodile spoons and Panther Martin spinners as well as a worm and bobber. Fly fishers can hook trout by using specialized patterns such as the Carey Special and Doc Spratley. Try using various retrieval speeds when casting for more success. 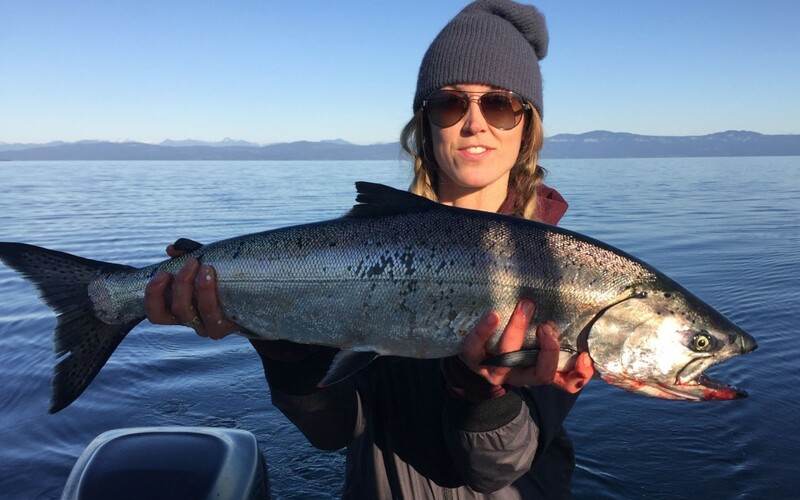 Big game fishing for steelhead is avialable for the adventurous fishers who want to get out during the colder months. he Quinsam and Nimpkish rivers as well as the The Gold, Salmon and Oyster rivers are all worth investigating from November through December, so you have lots of time to get ready for next year! Chinook can be found in the region of Bates Beach and Grants Reef brought in by the cold winter ocean currents. While trolling, try using a Hotspot Metallic Jelly or Purple Onion flasher in front of your bait to entice these fish. Jigging can also be done, using a chrome Point Wilson Dart around the edges of a bait ball. Dress warmly! The Puntlege River is a perfect spot to catch and release Rainbow and Cutthroat trout. During this time of year, the fish are feeling a little lethargic and so they tend to stay in deeper waters. Lures of choice include: Rubber pink worms and BC orange Gooey Bobs for anglers using gear rods. If you are fly casting, try your luck luck using Puntledge Worm patterns, egg patterns and stone flies. Wolf Lake has a reputation for having some really large trout when the winter weather sets in. Try using flatfish and black leech patterns when you are trolling. If you are fly fishing from shore, try using chartreuse PowerBait or a worm and bobber. If you have some P-Line Kikantors on hand try your luck at fishing for some Kokanee. Trout can also be found at Comox Lake, one of the most beautiful lakes. In this area, while trolling, try Krocodile spoons in Perch or Brass Fire-stripe patterns or cast small Vibrax spinners from your boat. Winter Spring fishing has been fantastic over the past month when the opportunity presents itself to get out there. The overall average size of the fish has increased steadily. 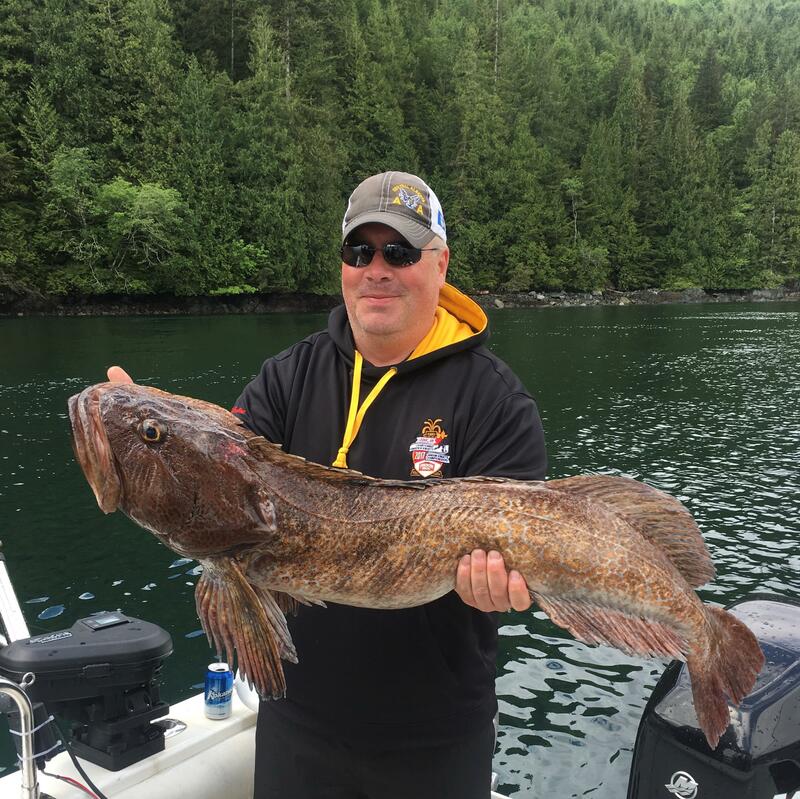 Several reports of fish in the 12-15 lb range from Shelter Pt off Campbell River to south at Tribune Bay off Hornby, and, including Powell River. Fishing winters will be EXCELLENT here until the large schools of Herring show up to spawn around the beginning of March. Kitty Coleman hump is producing good numbers and size as of late. Fish deep and on the contours. Most fish are between 200-250 ft. down on the rigger. Last time out 225 with Gibbs Delta Moon Jelly Flasher in combo with Gibbs Skinny G No Bananas spoon was the ticket. We successfully landed a nice 15 and a 12 with several undersize released. Other reports include 4inch 602 Tomic Glow plugs ran deep with a Dummy Flasher on the Cannon Ball. Troll faster than normal for these winter feeders! Again Campbell River has also had EXCELLENT winter spring fishing with most being dug up at Shelter Point. Purple Onion flasher seems to be the go to with the anchovy combo. Shorten your leaders on your anchovy tie ups to 4ft instead of the standard 6ft, tighter roll, these guys are active feeders. Recent reports of 20lb fish being caught. This area has also been producing nice fish up to 20lbs. Fish the contours extending east of Norris Rocks. Make sure you’rer close to bottom. Best combos that work well are cuddlefish hootchies, mostly with some kinda of green. The Jack Smith, Army Truck, and the UV Hornet being my favorites, in combo with Gibbs Delta Moon Jelly Flasher. Also anchovieshave worked well brined with the UV Green colouring. Weather being the main factor for getting out here, the SE winds make it impossible, so wait for the NW to show up. 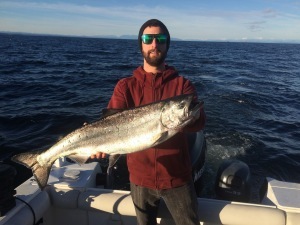 Dean McLaren of Powell River Sportsfishing reports Winter fishing has been steady around Harwood Island and also along the water front towards the Mill. Anchovy with guide series flashers, 4″ Tomic plugs in 600 glow series and G Force spoons are also producing, usual winter depths of 160 – 200 ft seem to be the ticket. Check out Dean on Instagram. Good Luck out there! Remember to check weather reports it changes fast this time of year!! In Campbell River and Comox, large herring are frequenting our waters in large numbers this winter. Along with that there are some very nice winter feeder chinooks, this winter is going to be special for sure! Troll fast near bottom with green gator cuttlefish or try a cop car spoon. Longer leader and speed are the ticket as these fish are feeding! We caught this 18 pound beauty at 230 feet on the rigger. Book a trip this winter at a reduced rate and we can hopefully meet up, it is very weather dependant at this time of year. Visit me on facebook for updated news and get in touch if interested in steelhead and the fly and I will point you in the right direction! In Campbell River and Comox, large herring are frequenting our waters in large numbers this winter. Along with that there are some very nice winter feeder chinooks, this winter is going to be special for sure! Troll fast near bottom with turd plastics or try a variety of cuttlefish glows and wammo. Longer leader and speed are the ticket as these fish are feeding! Thanks Tim & Sandy for making the video of our fishing trip this summer! Get ready for the mother of all fall Chinook runs, and some serious salmon insanity later this year in the Northwest. This morning, fishery managers put out a prediction of 1.6 million kings back to the Columbia, including 973,000 upriver brights. That’s on top of the 964,000 coho anticipated back to the big river, and another 230,000 to Oregon Coast streams. Thanks Linda & Doug for booking me this summer! OLYMPIA – Fishing prospects look bright this year for chinook in Washington’s ocean waters and the Columbia River, according to preseason salmon forecasts released today at a public meeting in Olympia. 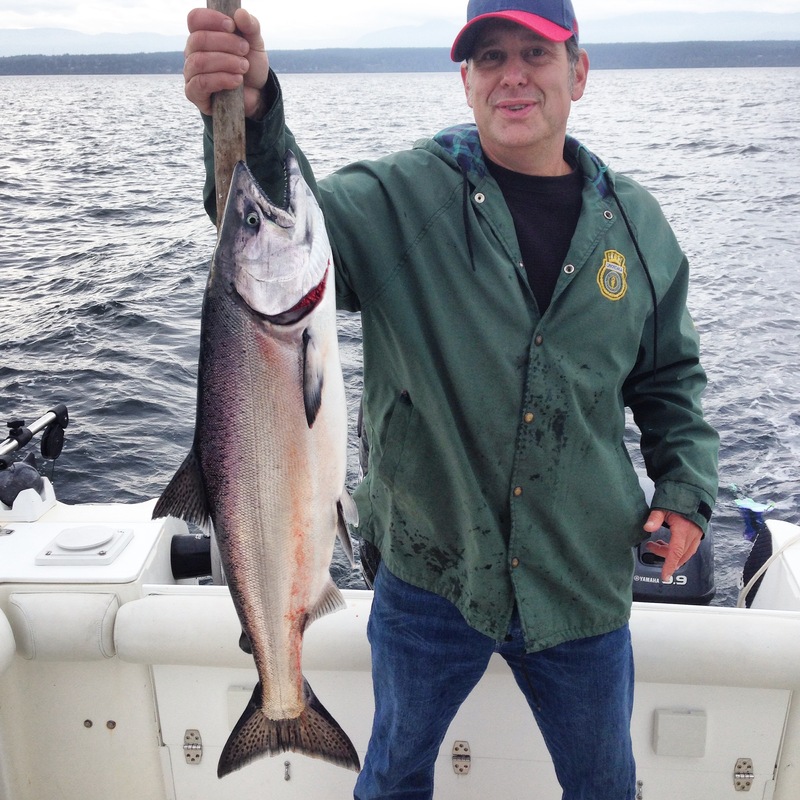 Opportunities for anglers also look good in Puget Sound, where coho and pink salmon runs are expected to be strong this year. Forecasts for chinook, coho, sockeye, pink and chum salmon mark the starting point for developing 2013 salmon-fishing seasons in Puget Sound, the Columbia River and Washington coastal areas. The forecasts were developed by the Washington Department of Fish and Wildlife (WDFW) and treaty Indian tribes. Fishery managers have scheduled a series of public meetings over the next few weeks to discuss potential fishing opportunities before finalizing seasons in early-April. A meeting schedule, salmon forecasts and information about the salmon season-setting process are available on WDFW’s website at http://wdfw.wa.gov/fishing/northfalcon/. Salmon fisheries developed through this extensive process will once again be driven by the need to rebuild depressed wild salmon populations while protecting healthy stocks, said Phil Anderson, WDFW director.